February 24, 2011. CD26, 8DPO. It kinda hurts to see it in plain English like that. At least the traditional two-pink-lines version gives you the tiniest bit of hope that maybe you’re reading it wrong, or maybe that line really IS there and all you need is a second opinion from your poor husband who is totally grossed out by holding a pee-stick so close to his face. The only positive is that the big fat negative on that test screen allows me to go on with my day, a little pissed disappointed, but moving forward nonetheless. The sad fact is that I’ve seen a lot of these tests in the past two-ish years since I married my best friend, so I’m no stranger to the disappointment. I know everyone says it, but I just figured that after spending all those years trying not to get pregnant, that actually accomplishing the task would be a cakewalk. This morning, after adding the insult of having to squat over a digital bad-news-bearer to the injury of unexplained infertility, I decided that maybe venting to my husband while he is trying to unwind after work was not the best solution to my recurring disappointment. 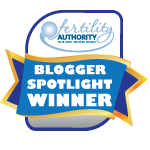 Blogging, I decided, would be the perfect way to force my thoughts upon innocent people who probably don’t care to read in such detail about my fertility forays. I mean, if that’s not the reason the internet was invented, then why? This blog is mainly a means for personal catharsis, but I hope that maybe by reading about my experiences, one person smiles, is educated, or feels not-so-isolated in their fertility struggles. I have been helped by sharing my thoughts online and others sharing theirs have helped me… I wish only to give a little back. Oh, but if you don’t care for TMI and rampant snarkiness… then you’re probably better off reading a blog about kittens. I love you 🙂 I love your blogs, no matter the topic. Miss you! Thank you for sharing! I didn’t know you were such a good writer! Good luck with those nightmares. They return in the middle of pregnancy too;) Which I KNOW you will be enjoying soon. Big Fan club chica! I started a blog because I was inspired by yours! I am still reading through all your posts, but I just wanted to say Thank you! You are just about the sweetest thing! I’m so glad you’re going to be blogging… It really will help you feel so connected to others going through the same thing you are. Know what else helps? Twitter. And massive amounts of ice cream. And adult beverages on the 3 days a month you’re allowed, lol.